HR metrics: Drive fact-based business decisions with powerful workforce insights. 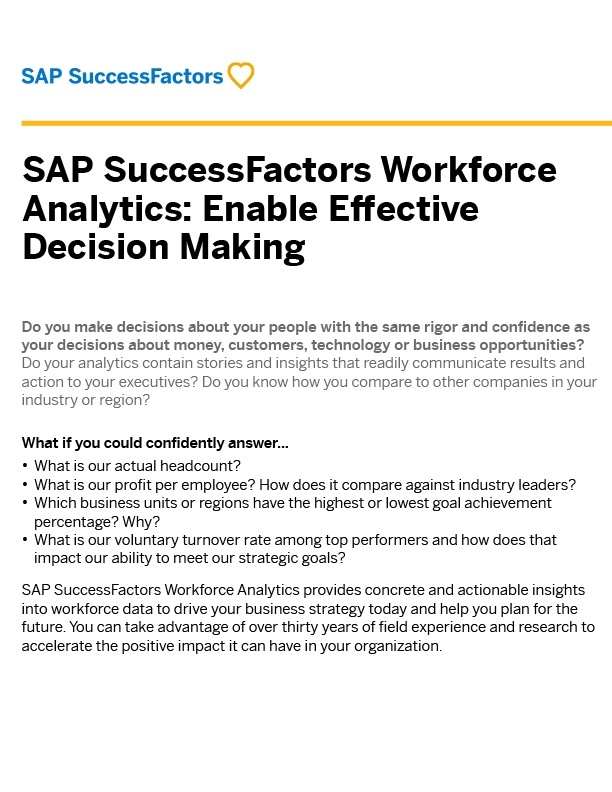 SAP SuccessFactors Workforce Analytics improves decision making by helping companies find answers to key questions about workforce challenges and provides guidance to help solve them. Answers that can help drive successful workforce initiatives. Driving impactful decisions with solid business evidence. Designed for business execution, Workforce Analytics is fully integrated with SuccessFactors, is easy to use, and provides the insights and tools you need to take action. With more than 30 years of expertise in HR metrics built into its tools, technology, processes, and services, SuccessFactors sets the standard for workforce metrics and benchmarks, and it provides the tools that make everyone successful. AltaFlux Corporation is a global HCM cloud consulting partner based in Troy, Michigan. We empower organizations by streamlining, transforming, and optimizing key human capital management (HCM) processes with industry-leading HCM cloud solutions.